According to the Alzheimer’s Association, there are an estimated 5.5 million people, 65 and older with Alzheimer’s disease. With this number growing each day, families need senior living communities that offer Memory Care services. As a result, Renaissance Village Rancho Belago reopened its newly remodeled Memory Care Villa on Monday, March 25. Villa Montaña provides memory care services for residents with Alzheimer’s disease or dementia. Our structured environment empowers residents to thrive with minimized barriers. The centralized design of our villa gives residents the support they need. In addition, residents receive more hands-on attention from caregivers. We look forward to the expansion of how we serve memory care residents and their families. at the heart of what we do each day at Renaissance Villages. Being a resident is more than living at Renaissance Villages. When you live here, you are part of the Renaissance Villages Family. As part of that family, we strive to get to know each resident. We get to know their likes, dislikes, and what will put a smile on their face. The better we know a resident, the better we can care for them. At Renaissance Villages, we gear the care we provide toward increasing residents’ quality of life. We provide a variety of activities that help residents stay active in all facets of their lives. Each activity engages residents in a variety of ways. We offer activities that engage residents physically, cognitively, sensory, socially, emotionally, creatively, and spiritually. We design activities to challenge residents without frustrating them. The more we get to know residents, the more we know which activities they’ll enjoy. Which allows us to create an environment that provides residents with purpose. We may ask a resident to help push another residents’ wheelchair or help with household chores. 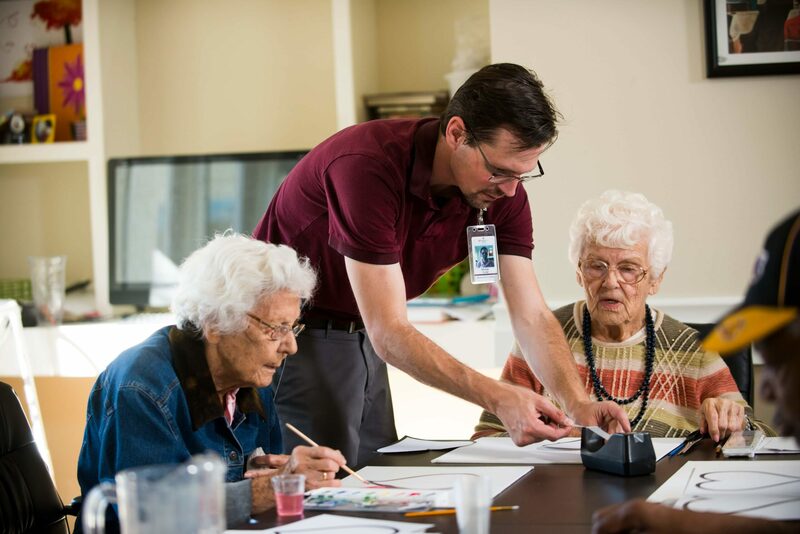 Giving residents a meaningful activity allows them to have a sense of purpose while meetings their cognitive needs. By continuing to provide different levels of engagement, we create opportunities for all residents to engage in activities. The increase in quality of life makes them happier and brings them joy. Overall giving them a reason to get up each morning. We’ve seen residents go from being disengaged to happy and engaged. Want to learn more about Memory Care at Renaissance Village Rancho Belago? Call today to schedule your tour of our Memory Care Villas today!